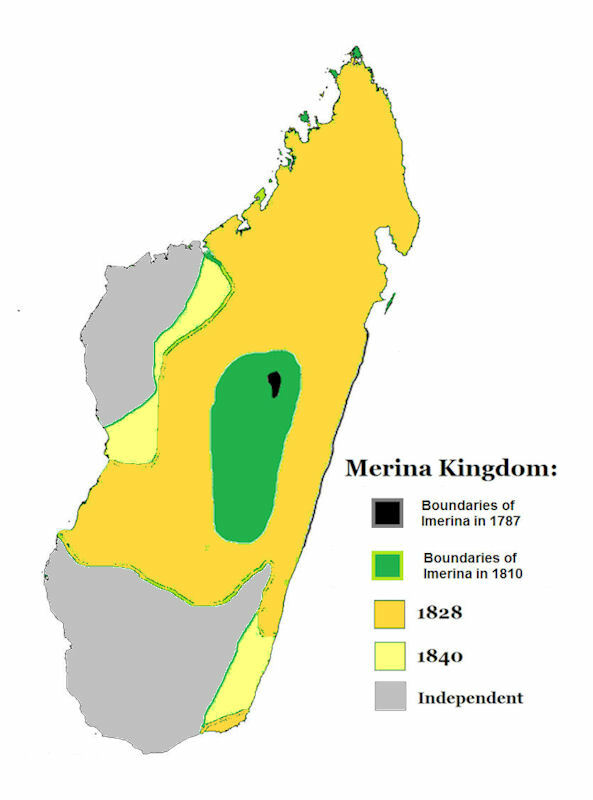 The most powerful of Madagascar's kingdoms — the one that eventually established hegemony over a great portion of the island — was that developed by the Merina ethnic group. Before the Merina emerged as the dominant political power on the island in the nineteenth century, they alternated between periods of political unity and periods in which the kingdom separated into smaller political units. The location of the Merina in the central highlands afforded them some protection from the ravages of warfare that recurred among the coastal kingdoms. The distinction, recognized both locally and internationally, between the central highlanders (the Merina) and the cotiers (inhabitants of the coastal areas) would soon exert a major impact on Madagascar's political system. Organized like the coastal kingdoms in a hierarchy of nobles, commoners, and slaves, the Merina developed a unique political institution known as the fokonolona (village council). Through the fokonolona, village elders and other local notables were able to enact regulations and exert a measure of local control in such matters as public works and security. The western coast was divided into two distinct and absolute hereditary Sakalava monarchies, which were the most powerful governments on the island during a period of about 170 years. The Hovas were tributary to the Sakalava chieftians until the commencement of the nineteenth century, when they began to throw off the yoke by invading the Sakalava territory under Andrianimpoina, and subsequently under his son, Radama I, who came to the throne at the age of 18 in the year 1810. Eventually, Radama married the daughterof the Sakalava King of Menabe and induced him to acknowledge the Hova supremacy. The western kingdoms submitting, their smaller neighbors were conquered in detail, so that in 1824 the greater part of the western side of the island was reduced to Radama’s rule, and he assumed the sovereignty of the whole island. His successors made the same claim, but though the Hova authority became established in the central and eastern Provinces, large portions of the south and west remained practically independent, and in other distant parts. Hovra rule was very slight. 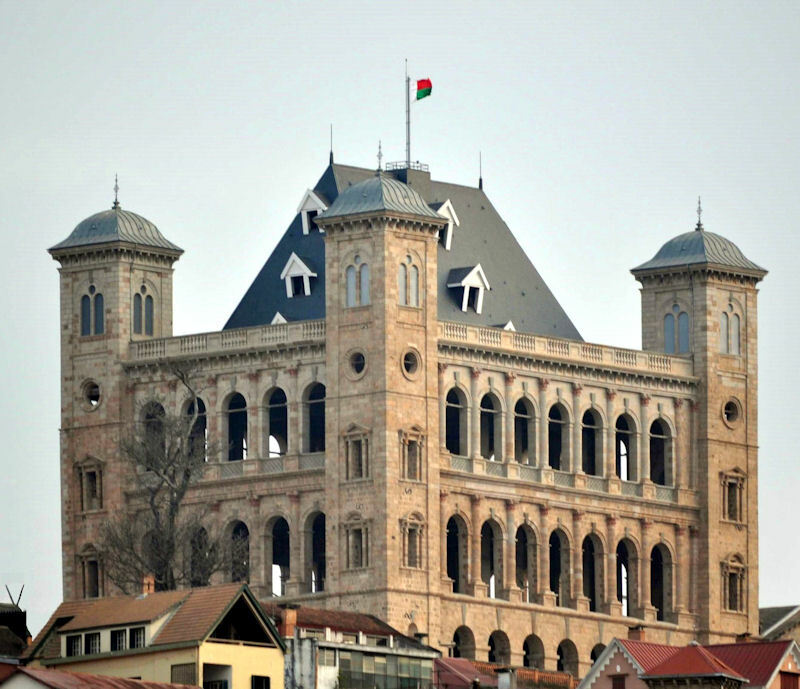 Two monarchs played key roles in establishing Merina political dominance over Madagascar. The first, who ruled under the name of Andrianampoinimerina (r. 1797-1810), seized the throne of one of the Merina kingdoms in 1787. By 1806 he had conquered the remaining three kingdoms and united them within the former boundaries of Imerina, the capital established at the fortified city of Antananarivo. Radama I (r. 1810-28), an able and forward-looking monarch, succeeded to the throne in 1810 upon the death of his father. By adroitly playing off competing British and French interests in the island, he was able to extend Merina authority over nearly the entire island of Madagascar. Radama I first conquered the Betsileo ethnic group in the southern part of the central highlands and subsequently overpowered the Sakalava, an ethnic group that also sought at times to assert its hegemony over other groups. The kingdom of Madagascar owed its origin to the prince Radama, the chief of the Ovahs, who, in energy and enlightened policy, resembled Peter the Great. This extraordinary man, after conquering a great part of the island, commenced the difficult but glorious enterprise of introducing into his empire the civilization and arts of Europe. He received and protected the missionaries, and promoted the establishment of schools, which, at the time of his death, had increased to more than 100, and in which nearly 5,000 children were taught. Several young persons were sent to Mauritius, and even to England, to receive instruction. Though imbued with the cruel superstitions of his countrymen, Radama I possessed great natural intelligence; he received a British envoy in 1816 with great kindness and made a treaty binding himself to abolish the export of slaves, he, in return, receiving an annual present of arms and ammunition. He wrote Malagasy in Arabic and French in Roman letters, and sent his two brothers to Mauritius to be educated; also, in 1818, received missionary teachers for his people and military instructors for his army. Through the intercession of the English, Radama began to abolish the slave trade in his dominions. With the help of the British, who wanted a strong kingdom to offset French influence, Radama I modernized the armed forces. In 1817 the peoples of the east coast, facing an army of 35,000 soldiers, submitted with little or no protest; Radama then conquered the entire southeast as far as Tolanaro. Particularly barren or impenetrable parts of the island escaped conquest, especially in the extreme south, but before his death Radama I succeeded in bringing the major and more hospitable portions of the country under Merina rule. Radama I's interest in modernization along Western lines extended to social and political matters. He organized a cabinet and encouraged the Protestant London Missionary Society to establish schools and churches and to introduce the printing press — a move that was to have far-reaching implications for the country. The society made nearly half a million converts, and its teachers devised a written form of the local language, Malagasy, using the Latin alphabet. By 1828 several thousand persons, primarily Merina, had become literate, and a few young persons were being sent to Britain for schooling. Later the Merina dialect of Malagasy became the official language. Malagasy-language publications were established and circulated among the Merina-educated elite; by 1896 some 164,000 children, mainly Merina and Betsileo, attended the mission's primary schools. Along with new ideas came some development of local manufacturing. Much productive time was spent, however, in military campaigns to expand territory and acquire slaves for trade. Radama was on the point of seeing his vast projects crowned with the most brilliant success, when his queen, a second Clytemnestra, caused him to be poisoned in July, 1828. Radama I died on July 27, 1828, aged 36, and was buried in a silver coflin, vast quantities of wearing apparel and valuable articles being buried with him. He left one child, a daughter named Kaketaka, aged 14 years, but was succeeded in the government by his senior wife, Queen Ranavalona. She, with her infamous accomplice, succeeded to the throne; and it seemed not improbable that this great kingdom would, ere long, be resolved into its original elements. She was cruel in the extreme, and endeavored to undo all the good Radama had accomplished; she drove away the British resident, broke the treaty against slave export, and caused a reaction in favor of superstition and barbarity. The reign of Radama I's wife and successor, Queen Ranavalona I (r. 1828-61), was essentially reactionary, reflecting her distrust of foreign influence. In 1835 all natives were prohibited from professing Christianity or attending the schools, and those who would not recant were put to death. During 25 years the country was isolated from all foreign influence and trade, and so much cruelty was used toWard the Sakalavas of the north that they placed themselves under French protection, and in 1840 ceded Nosi Be, which thenceforward remained a French possession. In 1861 Ranavalona died and was succeeded by her son, Radama II, who only reigned 18 months. Under the oligarchy that ruled in her name, rivals were slain, numerous Protestant converts were persecuted and killed, and many Europeans fled the island. The ruling elite held all the land and monopolized commerce, except for the handful of Europeans allowed to deal in cattle, rice, and other commodities. Remunerations to the queen provided the French traders a supply of slaves and a monopoly in the slave trade. Enjoying particular favor owing to his remarkable accomplishments was French artisan Jean Laborde, who established at Mantasoa, near Antananarivo, a manufacturing complex and agricultural research station where he manufactured commodities ranging from silk and soap to guns, tools, and cement. During the reign of Radama II (r. 1861-63), the pendulum once again swung toward modernization and cordial relations with Western nations, particularly France. Radama II made a treaty of perpetual friendship with France, but his brief rule ended with his assassination by a group of nobles alarmed by his pro-French stance. He was succeeded by his widow, Queen Raosoherina followed, who ruled until 1868, during which time she annulled the treaty with France and the charter of Laborde's company. 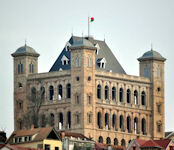 She reigned five years; allowing the country in that period to make steady progress in morals, humanity, and religion. After her death on April 1, 1868, Queen Ranavalona II, cousin of the former Queen, was crowned, holding the Bible in her right hand, while all idols were excluded from the ceremony. In February 1869 the Queen and prime minister were baptized, and in September all idols and charms were buried by royal command throughout the central Province of Imerina. In 1870 the number of missionaries was increased from 10 to nearly 40. After 1868 a Merina leader, Rainilaiarivony, ruled the monarchy. To avoid giving either the French or the British a pretext for intervention, Rainilaiarivony emphasized modernization of the society and tried to curry British favor without giving offense to the French. He made concessions to both countries, signing a commercial treaty with France in 1868 and with Britain in 1877. Important social developments under his leadership included the outlawing of polygamy and the slave trade; the promulgation of new legal codes; the spread of education, especially among the Merina; and the conversion of the monarchy in 1869 to Protestantism. Domestic slavery had been an institution of the country from time immemorial, but on June 20, 1877, the importation of African slaves was prohibited, and those in the country were emancipated as far as Hova authority extended. Queen Ranavalon'a II reigned more than 15 years, generally loved for her kindness of heart and humane disposition, and was succeeded July 13, 1883, by Queen Ranavalona III, destined to be the last ruler of an inde-. pendent Madagascar. The differences between the Hova Government and the French became, during her reign, gradually more acute, until, in support of their claims, the French Government delivered an ultimatum by the hands of an envoy on October 18, 1894. On its refusal, an expeditionary force of 15,000 men landed at Majunga, on the northwest coast, marched on Antananarivo, and occupied it on September 30, 1895; the next day a treaty was signed by the Queen admitting all the French claims. A protectorate was at once established, but, in 1896, the island was declared a French colony, and on February 27, 1897, the Queen was called on to resign and was removed to the island of Reunion, where she arrived on March 4.